This article is about the cultural/political concept. For other uses, see Basket (disambiguation). "Rice bowl" redirects here. For the American football championship in Japan, see Rice Bowl. 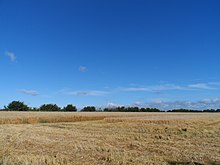 The breadbasket of a country is a region which, because of the richness of the soil and/or advantageous climate, produces large quantities of wheat or other grain. Rice bowl is a similar term used to refer to Southeast Asia, and California's Salinas Valley is sometimes referred to as the world's salad bowl. Such regions may be the subject of fierce political disputes which may even escalate into full military conflicts. Sicily and Africa were considered the breadbaskets of the Roman Republic. Later on, Egypt was considered the breadbasket of the Roman Empire. Crimea was the source of a huge quantity of grain supplied to Greek city-states, especially Athens. Since subsistence agriculture was the dominant economic system in most of Morocco's history, it's difficult to speak of a breadbasket region. All regions produced their own wheat and barley to feed themselves and their livestock. With the European commercial penetration in the second half of the 19th century, Morocco started to export wheat to Europe despite the objection of the ulama (religious establishment). The Chaouia and Doukkala plains became the most important suppliers of wheat for export. This is logical given their proximity to the coast. The ports of Casablanca and Feddala, today's Mohammedia, serviced the Chaouia Plain while the port of Mazagan serviced Doukkala. After Morocco's independence, agriculture in Doukkala became geared toward irrigation so less area has been devoted to wheat, whereas Chaouia maintained its status as a major wheat-producing region thanks to its dark soil called tirs and relatively abundant rainfall (avg. 400 mm/year). The Free State province is often considered the breadbasket of South Africa due to its wheat, sunflower and maize fields. The Overberg region in the Western Cape is also known as the breadbasket of South Africa due to its large wheat fields, as well as fruit growing. Zimbabwe (formerly known as Rhodesia) was allegedly known as the breadbasket of Africa, exporting wheat, tobacco, and corn. The Punjab and Haryana regions are considered the breadbaskets of India. West Bengal is said to be the "rice bowl" of India. Even though its rice production is just enough to be self-sufficient for the province's large population, it is the largest producer of rice in India. The Punjab province is considered the breadbasket of Pakistan. Sichuan has historically been known as the "province of abundance" due to its agricultural prowess. The regions on the banks of the Yellow River and Yangtze River southern Jiangsu and Zhejiang provinces have also been known for their rich fertility. The Al-Jazira area in northwestern Syria, and its Euphrates basin is considered the country's breadbasket due to its abundance of wheat. The plains of Java are considered the rice bowls of Indonesia. Kedah is considered the rice bowl of Malaysia, accounting for about half of Malaysia's total production of rice. In 2008, the government of Kedah banned the conversion of paddy fields to housing and industrial lots to protect the rice industry. The province of Nueva Ecija found on Luzon island is considered the rice granary of the Philippines because of the vast tracts of land used for rice production. The Irrawaddy Delta in Myanmar used to be one of the most important sources of rice in the region until its production declined due to various reasons, including the country's unstable political situation. The Chao Phraya delta is considered the rice bowl of Thailand. The Mekong delta in Vietnam is considered the country's rice bowl. Southern Dobruja, a fertile plain region in Bulgaria's northeast between the Danube and the Black Sea, is commonly considered the country's breadbasket. The central plain called Mesaoria surrounding the capital Nicosia has long served as the island's granary. Province of Southwest Finland has the warmest climatic conditions in continental Finland and fertile soil, making it the breadbasket of Finland. The Beauce plains are considered the breadbasket of France. East Prussia was considered as breadbasket of German Reich. The Hungarian Plain has produced significant amounts of corn and grain. In the early 20th century, 34% of Europe's total corn production and 11% of the European flour production was grown in Hungary. The eastern half of Ireland is the traditional breadbasket, with the western part being used for pasture. In the 18th and early 19th centuries, Ireland was itself the breadbasket of the United Kingdom of Great Britain and Ireland, with Irish grain feeding Britain's industrial cities while Irish peasants subsisted on potatoes. This was to lead to the Great Famine of the 1840s. Alentejo is considered the breadbasket of Portugal. In the 19th century, Romania was considered part of Europe's breadbasket. During Tsarist times, the Ukrainian provinces of the Russian Empire were referred to as the Empire's breadbasket. During the Soviet era, the mantle passed to the Ukrainian SSR. There is also the Central Black Earth Region within Russia proper. Vojvodina was considered the breadbasket of Serbia. About 70% of its agricultural products are corn, 20% industrial herbs, and 10% other agricultural cultures. Andalusia is considered the breadbasket of Spain. The primary cultivation is dryland farming of cereals, olive trees, vineyards and sunflowers. Using irrigation, a large amount of maize, strawberries, citrus and rice are also grown on the banks of the Guadalquivir river. In the 18th century, there were plans to drain the Ljubljana Marsh and transform it into the breadbasket of Carniola. Scania is considered the breadbasket of Sweden. The yield per unit area is higher than in any other region in Sweden and the soil is among the most fertile in the world. The Scanian plains are an important resource for the rest of Sweden since 25–95% of the total production of various types of cereals come from the region. Eastern England, particularly East Anglia, the Vale of York and South-East England are considered the main crop-producing areas of the UK. In Canada, a major grain-growing area is also called the Canadian prairies. Sometimes the province of Saskatchewan, also known for producing a huge supplement of potash, is further singled out from within this region as the main breadbasket of Canada. 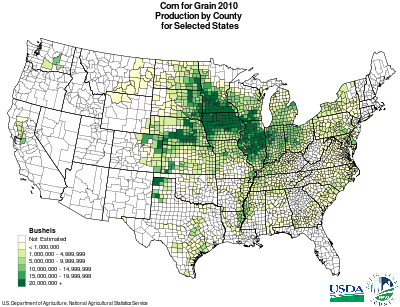 In the United States, an important region is the Corn Belt, where maize and soybeans are major crops, which generally extends from the Great Lakes south through Missouri. Further to the west in the United States and Canada, east of the Rocky Mountains, is the Wheat Belt, where the climate is too severe for maize or soybeans. Additionally, the San Joaquin Valley in California has also been called the breadbasket of the world. The San Joaquin Valley produces the majority of the 12.8% of the United States' agricultural production (as measured by dollar value) that comes from California. Grapes—table, raisin, and, to a lesser extent, wine—are perhaps the valley's highest-profile product, but equally (if not more) important are cotton, nuts (especially almonds and pistachios), citrus, and vegetables. 70% of the world's and 100% of the U.S. supply of almonds comes from the valley. Oranges, peaches, garlic, tangerines, tomatoes, kiwis, hay, alfalfa and numerous other crops have been harvested with great success. According to the 2002 Census of Agriculture's ranking of market value of agricultural products sold, nine of the nation's top 10, and 12 of the top 20, producing counties are in California. The Murray-Darling Basin is seen as Australia's breadbasket, being the source of 40% of the nation's agricultural income, a third of the wheat harvest, 95 percent of the rice crop and other products such as fruit, wine and cotton. When New Zealand became a British colony, the fertile lands produced food that would be shipped back to England, causing New Zealand to become colloquially known (occasionally along with Australia) as Britain's breadbasket, subsequently leading to the Dunedin being the first ship to complete a truly successful transport of refrigerated meat. She was refitted with a refrigeration machine with which she took the first load of frozen meat from New Zealand to the United Kingdom. In the 19th century, access to the Californian and Australian markets made wheat export a very lucrative activity. In the mid-19th century, those countries experienced large gold rushes, which created a large demand for wheat. Chile was at the time the "only wheat producer of some importance in the Pacific". Brazil is also seen as a breadbasket, as it is the world's largest supplier of coffee and contains vast tracts of arable land. ^ "Drought hits millions in Thai rice region: government". www.terradaily.com. Retrieved 1 January 2018. ^ Bryce, Emma (2013-05-08). "Wildlife forced out of California 'salad bowl' by food safety regulations". The Guardian. Retrieved 2013-08-05. ^ Kaplan, Sheila. "Salinas, California: The Salad Bowl of Pesticides". Politics Daily. Retrieved 2013-08-05. ^ "South Africa : Accommodation : Free State". web.archive.org. 28 March 2006. ^ "From Breadbasket to Dustbowl". 13 April 2005. Retrieved 1 January 2018. ^ Vatahov, Ivan (2001-08-23). "Drought leads to low yields in Dobrudja". The Sofia Echo. Sofia Echo Media Ltd. Retrieved 20 September 2015. ^ Duijzings, Ger (2014). Global Villages: Rural and Urban Transformations in Contemporary Bulgaria. Anthem Press. p. 110. ISBN 9781783083510. ^ "Elinkeinoelämä". Regional Council of Southwest Finland. Archived from the original on 2016-06-02. Retrieved 2016-08-07. ^ "Food, feasting and folklore". www.independent.ie. ^ Halloran, Amy (26 June 2015). "The New Bread Basket: How the New Crop of Grain Growers, Plant Breeders, Millers, Maltsters, Bakers, Brewers, and Local Food Activists Are Redefining Our Daily Loaf". Chelsea Green Publishing – via Google Books. ^ bairishstudies (12 January 2016). "The Eighteenth-century Celtic Tiger". ^ Bourke, Angela (10 April 1991). "The Field Day Anthology of Irish Writing". NYU Press – via Google Books. ^ Pickering, Paul; Tyrell, Alex (1 August 2000). "The People's Bread: A History of the Anti-Corn Law League". Bloomsbury Publishing – via Google Books. ^ Melik, Anton. 1959. Slovenija: Geografski Opis, vol. 2, part 3. Ljubljana: Slovenska Matica, p. 187. ^ Vidic, Marko. 1987. "Agrarna revolucija." Enciklopedija Slovenije, vol. 1, pp. 20–21. Ljubljana: Mladinska knjiga. ^ "EB5 Northern California - Breadbasket Of The World". eb5northerncalifornia.com. Retrieved 1 January 2018. ^ (in Spanish) La Hacienda (1830-1930). Memoria Chilena. ^ (in Spanish) Villalobos, Sergio; Silva, Osvaldo; Silva, Fernando and Estelle, Patricio. 1974. Historia De Chile. Editorial Universitaria, Chile. p 481-485. Look up breadbasket in Wiktionary, the free dictionary.